Cuba is one of the most picturesque places on earth. Offering an array of colours and quirks, there’s a vibrancy here that’ll take your breath away. From classic cars to sugar sand beaches, it’s easy to see why so many travellers want to visit Cuba. For connoisseurs of the bolder things in life, Cuba’s renowned rum and world-famous cigars ought to hit the spot nicely! Culture vultures are in for a treat, too; with so many UNESCO World Heritage sites to see, you’ll almost certainly forget about your guidebook and dive straight in to its trove of historical wonders. A place that deserves your full attention, Cuba is also well-known for its friendliness and hospitality. And now, thanks to Cuba touring holidays from Travelsphere, you’ll get to experience all that’s great about this island nation first-hand! 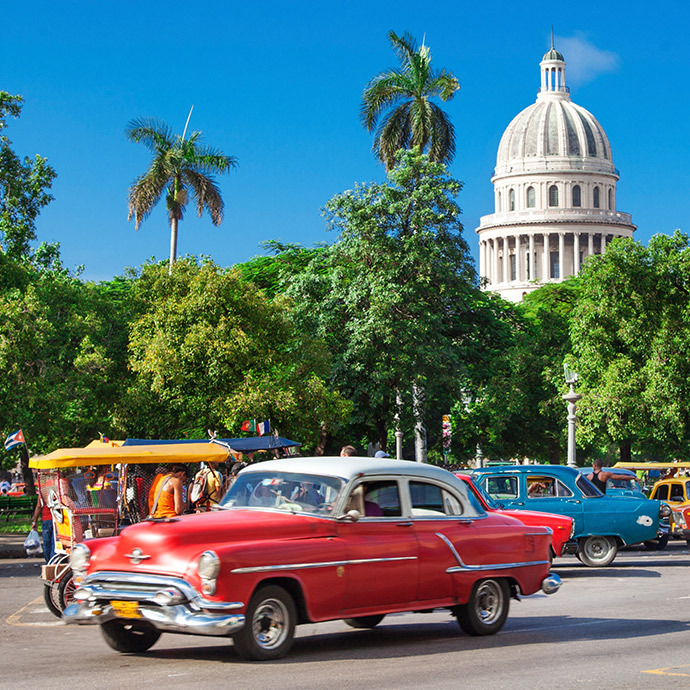 Our Cuba escorted tours are expertly crafted and plug you into the authentic culture of this vivacious country, boasting quality and convenience in equal measure. A good option for first-time visitors – and yet, equally, appealing to seasoned explorers – you can always find something new and exciting (the discoveries seem to be endless!). Whether listening to live jazz in Havana or taking in the views along the Viñales Valley, you’ll feel at home in no time. Visit captivating Cuba with Travelsphere for an unforgettable adventure! The art of turning tobacco into cigars by hand is something Cuba is famous for, and Havana is dotted with factories where they are produced. On a holiday to Cuba you can visit one of these factories to experience this highly skilled and fascinating process for yourself.